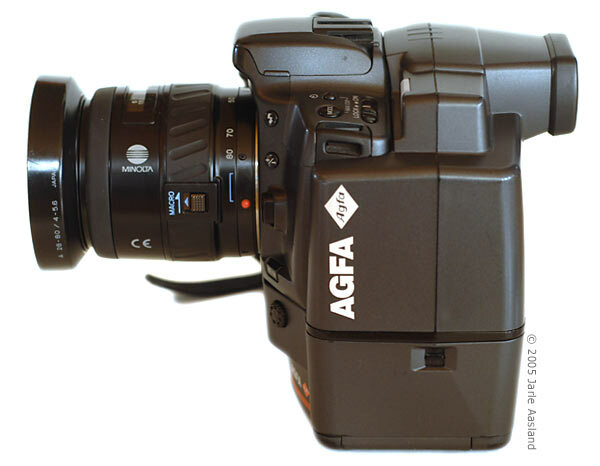 Agfa? Minolta? Are you insane? I know, I know. Being a Nikon site, this camera shouldn't be here. That being said, I'm a Nikon fan, but not religiously so. I have no interest in brand wars (let the big companies do their own marketing). Nikon or Canon? Doesn't matter. PC or Mac? Couldn't care less. 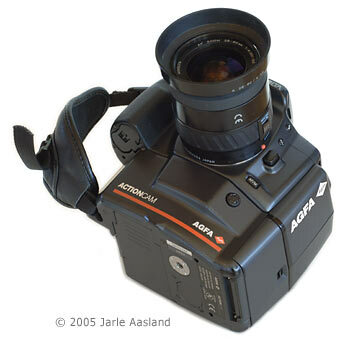 When I was offered a 1996 AGFA ActionCam (also sold as Minolta RD-175) for practically nothing, I had no choice. This 1.75 megapixel camera based on the Minolta Maxxum 500si film body sold for around $10.000 some ten years ago, and made a nice addition to my growing collection of vintage DSLR's. The ActionCam uses three CCD's to capture data at an optical resolution of 768 x 494 pixels, which is then interpolated to 1,528 x 1,146 pixels (1.75 megapixels). The three CCD system uses one red-blue chip and two green chips, which are set askew by half a pixel to achieve four times the pixel resolution. For more details, check the links below. Physically, the camera simply looks like an ordinary Minolta film body with a bulky digital back/motor drive/battery pack attached. I can't decide if it looks lame or cool - it really depends on the angle you look at it. The camera is surprisingly nice to hold, but has a distinct plastic feel to it. It's no Nikon. (I've never liked Minolta cameras, and I still don't). 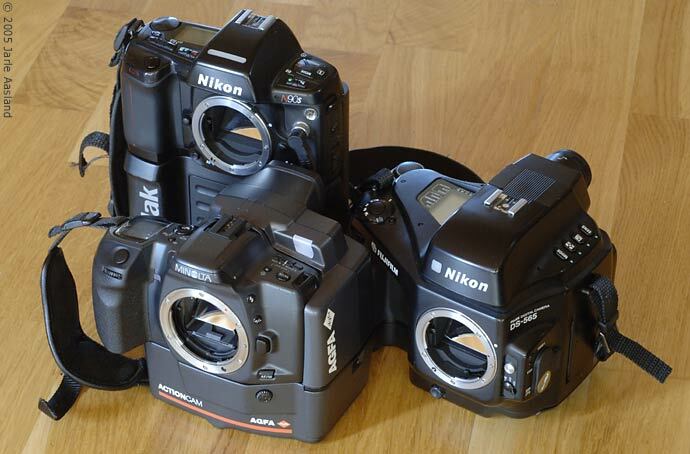 The ActionCam is smaller than both the Nikon E-series and early Kodak DCS cameras. My ActionCam came with an original Minolta 28-80mm f/4 - f/5.6 zoom, two batteries, a charger and an original 130 MB «AGFA ACTIONCAM DIGITAL FILM» memory card. Everything in very nice condition. Apparently, many of the early digital cameras are still in surprisingly good condition. I guess they were often considered too bulky and slow for any serious field work, and were mostly used in a studio or under other controlled conditions. Also, they were too expensive to mess up. Unfortunately, the memory card (hard drive) that came with the camera is a Type III Mass Storage device, meaning that the card will not fit the single PCMCIA slot on my current laptop (it will fit if you have two empty PCMCIA slots on top of each other). Unfortunately, I was unable to test the camera even after charging the battery. Turns out that the rechargable battery only provides power for the digital part of the camera. The actual camera body requires an additional 2CR5 6V 'camera battery'. 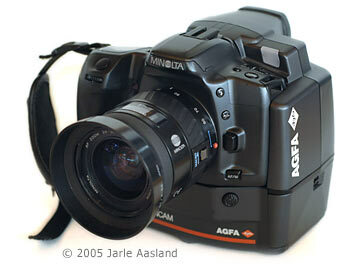 Like I mentioned, it's really just a Minolta body with some digital stuff attached. Having bought a new battery for the camera body, I quickly discovered that the rumours on various discussion boards are true: This camera is very grumpy about its memory. The original card doesn't work anymore (it's apparently been used for other things, and the camera doesn't approve). The camera will power on, but will soon display an 'Er' message on the LCD display. Same with my 40 MB IBM card. Frustrating. The camera will now start without any error messages, but instead of displaying the number of remaining shots, it will simply display '--'. I still can't make it fire, even if the light meter and everything else seems to work. I'll try to find a cheap Sandisk card and see if that works. Update: Found this on rec.photo.equipment.35mm: "I found a statement in a RD175 faq on a minolta website claiming that the camera should be able to accept Sandisk compact flash cards + ata adapter. 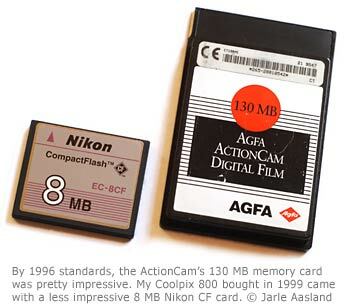 I also read that to get that to work the cf card should be formatted in the camera." Looks like I'll have to get both a Sandisk card and a SCSI cable..
Update, December 2005: I recently came across a Minolta RD-175/Agfa Actioncam SCSI cable and Adaptec AHA-2940 SCSI card on eBay. «Buy It Now» for $40, and so I did. I installed the SCSI card on a Windows XP system (plug and play), downloaded the RD-175 software from Minolta's website, connected the camera and restarted the PC. Much to my surprise, Windows discovered the camera all by itself. Sounds easy enough (and I guess it is), but I had to deal with a few issues along the way. For example, Windows kept displaying the «Found New Hardware» message. I had to install the software several times before everything worked. Apparently a bug with the Minolta software. Also, working with SCSI devices, you need to turn off your PC whenever you change your setup (switch memory card, etc.). Frustrating. I restarted the PC several times before I could finally make the Minolta software detect the camera and allow me to format the memory card. I was finally able to format an old Sandisk 16 MB CF card. Using the Minolta software, this will create a unique MDC.CTL file on the card. Without this hidden file, the camera will not recognize the card at all. For some reason, you can't simply copy the file from one card to another. 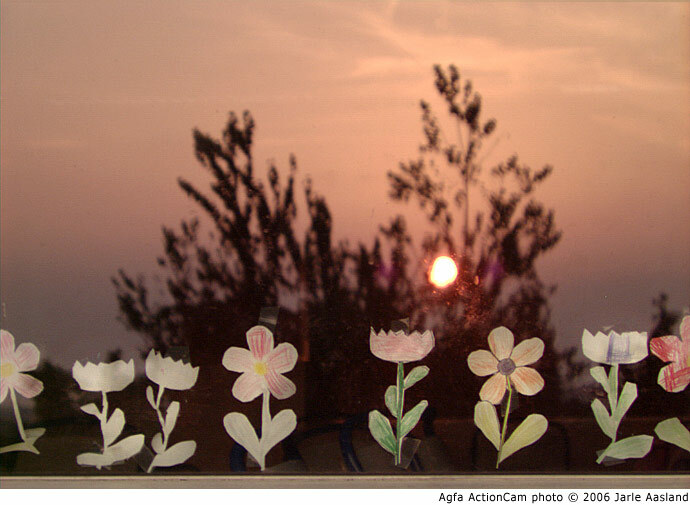 Each card must be formatted in the camera, by the Minolta software. To do this, you need to have a working SCSI setup. I'm happy to report that the CF card does indeed work with a regular PCMCIA adapter. I fired off a few quick test shots and went looking for some useable software. The Minolta Twain driver seems a bit unstable and slow, so I wanted another solution. Few programs will read the .MDC files produced by this camera, but ThumbsPlus Pro (www.cerious.com) will. 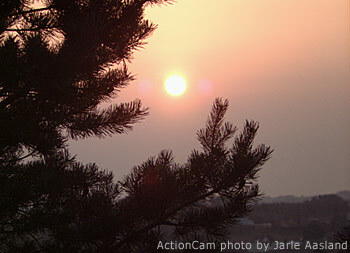 You can also use dcraw, a free, open-source program to process raw image files from many different camera models. More info on how to use the dcraw command line utility. First impression: The images are too red, reminding me of the early Kodak DCS models. Too sensitive to IR wavelenghts. Typically, the 1528 x 1146 pixel photos will require some (heavy) post processing. Still, image quality in my first less than perfect test shots were better than expected. Yet another update, May 2011: a forum member posted how to clone RD-175/ActionCam memory cards using the freeware version of Easeus Todo Backup. More information found here. You can download the card image here (link may expire, so get it while you can).